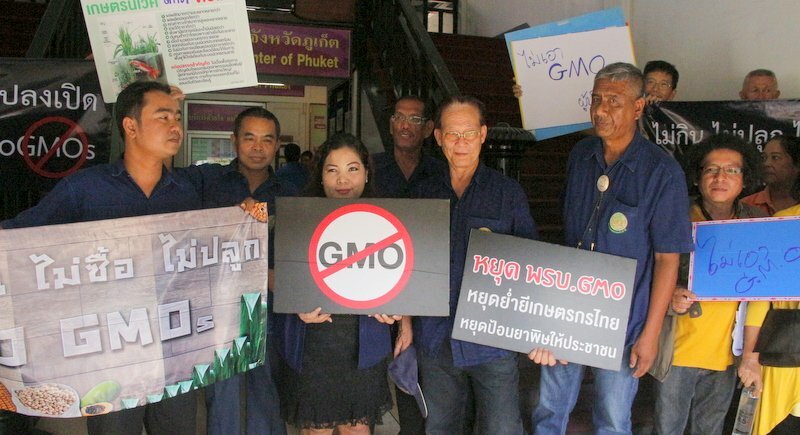 PHUKET: More than 20 members from the Phuket Farmers Association joined their counterparts nationwide to protest the controversial bill regulating genetically modified organisms (GMOs). The protesters arrived at Provincial Hall on Wednesday (Dec 9) to hand to Phuket Vice Governor Chokdee Amornwat an official request for Prime Minister Gen Prayut Chan-o-cha to suspend the passing of the Biological Safety Bill until it has been properly amended. The request asked for a committee, which would include farmers and GMO experts, to be formed. The Office of the National Economic and Social Development Board and the Ministry of Commerce, among other government agencies, should be consulted in drafting the bill, the letter said. Such agencies should provide advice to small local farmers on what could be done to remain competitive in response to market changes if the bill is passed, the letter added. It also requested special attention be given to ensure that the passing of the bill does not affect consumer health or small farmers or other agricultural businesses. “The draft bill was approved by the Cabinet on November 24, and we don’t want it to go any further without the needed changes made. It will seriously affect the agricultural industry, our food, and the lives of farmers and farming families,” said Somchai Yeesan, one of the protestors. For more national coverage of the new bill, see this report on Bangkok Post, as well as this report on The Nation and this report on Asia One.